Owing to our rich industrial expertise and skills, we are renowned as one of the profound manufacturers and suppliers of Wrought Iron Candleholder. Our perfect range of beautiful iron candleholder features fine finish with elegantly engraved holders. 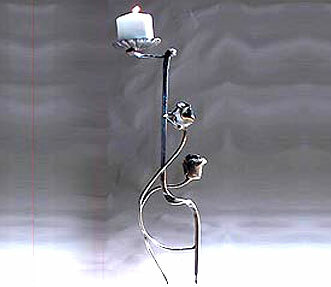 We use of high grade wrought iron for manufacturing this range of candle holder. This range is treasured for its stylish finish and resilience features. Further, our outstanding decorative Wrought Iron Candleholder are used for decorative lightening at number of places like gardens, lawn, hotels corridors, homes and many more. Description : Wrought iron candleholders in an exquisite flower twig shape, when hold illuminating candle represent a mesmerizing panorama in the surroundings.